Every week, we will be highlighting some of your forum posts as well as featuring member stories about their journeys with TMJ disorder. For our first Forum Flashback, we would like for you to meet Jonesy (his real name is Pete). He is a new member from Australia, who has had TMJD for many years. His persistence with research and articulate way of explaining his thoughts make his posts an absolute pleasure to read. Welcome, Pete! Over the Counter Night Guards -join Nedra and crew as they discuss the pros and cons of over the counter night guards for jaw pain that you can buy at the drug store. Many members noted that the over the counter splints made their pain worse. Do you think this is an effective way to treat TMJD or bruxism? Have you tried it? What was your experience like? What Do You Do for Stress Relief? – Nicole wonders what the fellow TMJ Hope members do to relieve stress when they are going through a particularly rough time. Members mentioned yoga, music, breathing, and walking. As we all know, stress can make jaw pain worse. How do you deal with this? 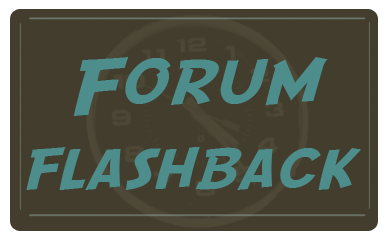 Well, that wraps up this week’s ‘Forum Flashback’! We hope that you will take a moment to share your story or create a thread on the forum so that we can feature YOU in the next edition! The forum is a fantastic place to ask questions, give & receive support, and meet new people who really do understand what you are going through.